Your child has proudly achieved his "Garolou", he/she is over 6 years old, and you want him/her to be able to turn snow plough on an easy slope and that he/she can use the ski lifts for beginners. From the age of 8, he/she wants to try snowboarding, our beginners area is the ideal and most enjoyable place to start. The ESF Les Brasses instructors are here to give him/her all the necessary tools to achieve a good practice of the activity in an atmosphere mixing pleasure and gliding. Whether in group lessons or in private lessons, he/she will be able to get the "Ourson", that will open the door to the stars! 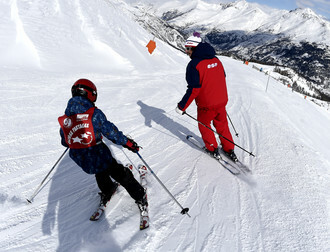 The ESF Les Brasses offers throughout the whole season cross-country skiing group lessons for a week long or on Wednesdays and Sundays outside French school holidays. Our lessons are adapted to the school rhythm so that children can enjoy the pleasure of skiing all winter long. From the age of 6, after mastering balance and the first essential tools to move independently while wearing skis, in other words after having obtained the "Ourson" level, children, enthusiastic admirers of the "skaters", wish to learn the skating (freestyle) move, first without ski poles, then learning how to turn while gliding, learning how to overcome small bumps and how to control their speed, it is the beginning of a progression from the "FLOCON" to the "GOLD STAR" which lets the skier enjoys the pleasure of gliding. AlpinE, SNOWBOARD oR cROSS-COUNTRY EVERYDAY! For all your needs, for all your wishes! Does your child want to discover a new discipline? Do you want him/her to progress at his/her how pace with one of our instructors? Private lessons are particularly adapted so that each child can become more confident and make progress at his/her own rhythm. For more information and to make a booking, please contact us on the +33 (0)4 50 36 61 96.